The Secret Weapon Air Filter is a result of years of testing and tuning of air intake velocity, Air mass and Airspeed. The Result, an Air filter that performs better than any other air filters available in the market today. The Secret Weapon Air Filter provides maximum airflow with the protection of high quality dense Poly Urethane Foam. Studies have shown Flow rates of up to 80% more Air and Better Dirt Filtration with Foam Filter than the conventional cotton filter. The Secret Weapon Air Filter’s main feature is an CAD Designed and Flow benched Tested Velocity Stack, which greatly increases airflow ,airspeed and air mass into the engine, therefore increasing engine performance. Another one of the Secret Weapon Air Filter’s great features are the capability to be disassembled to be cleaned and then re-assembled after cleanings of the foam filtering element. Weapon.R Air Filters do not clog, because our filters feature Open Cell Technology Foam, which allows air to flow around the captured dirt. Unlike other filters, Weapon.R Air Filters provides great airflow even when it gets dirty. Available in different inlet sizes and lengths. 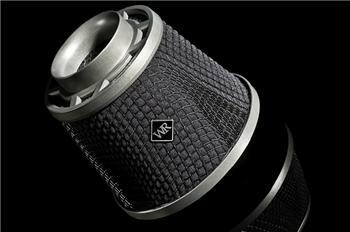 Weapon-R Dragon Filter is one of the highest rated air filter in the world. Rated Best Overall Performer outperforming Cold Air & Short Ram Intake systems in the 2003 Tuner Performance Reports, Intake system Battle. The Dragon Air Filter provides maximum airflow, with the protection of high quality dense Polyurethane Foam. Studies have shown up to 80% more Air and Better Dirt Filtration with Foam Filter than the conventional cotton filters. Featuring technology from the Secret Weapon Air filter, an internal tuned Velocity Stack provides more air into the engine. Available in different inlet sizes and colors.